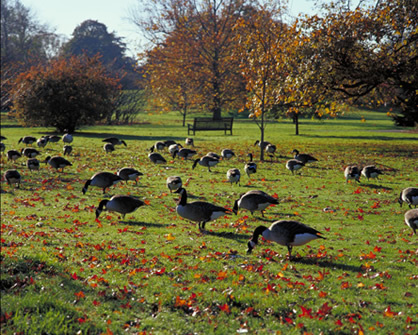 Few things restore the soul like being out in nature on a fine autumn day, and nowhere in London is autumn finer than at bountiful Kew Gardens! Including a visit to stately Kew Palace serves to add intriguing historical context to any all too brief visit, via glimpses into the lives of former royal Palace inhabitants, most notably among them, King George III, his Queen, Charlotte and their children, over summers, then, later, with two of their grown, unmarried daughters, at the time of the King’s seeming insanity, from metabolic disorder porphyria. Re-accessing the beloved grounds through the lens of its royal history provides a clearer picture of the life of the well loved and looked after Gardens, first opened to the public in 1898 by then aged granddaughter of Queen Charlotte, Queen Victoria, who, the year before donated Queen Charlotte’s Cottage to Kew to commemorate her Diamond Jubilee on condition its’ surrounding grounds were naturalistically maintained; her wishes were and are respected. Any visit to Kew Gardens, no matter how well planned would be too brief, for in addition to its’ multi-cultural array of trees, shrubs and wild and, formal flower beds and displays, its’ 300 hundred verdant acres, a UNESCO World Heritage Site since 2003, boast three large glass houses or conservatories, each nurturing its own unique, quietly dynamic botanical life, with information about its origins and oft surprising facts on the most outstanding specimens among them. How often does one become aware of time and timelessness while walking through a grove of trees, originally planted, in some cases, centuries before, placed according to their continent of origin, i.e. North America, represented by the sheltering Pinetum, its’ needled trees standing tall, and taller still in the adjoining Redwood Grove. The crunch of leaves and cones intermingle in both. Countless benches along the paths with brass plated dedications to lost loved ones who enjoyed Kew Gardens glow with the sun-lit appreciation of visitors gone by. Though living, I am in that number, a lover of same. Keeping to our long held promise to arrive at the gardens at opening time, we entered the grounds at 9:30 am, more than happy to greet its’ shining lake and impressive Victorian Palm House, with scant visitors joining us. The peace of the Gardens crowded or not, tends to silence thought, in favor of appreciation of the moment, ever one of serenity and beauty in that venerable place. 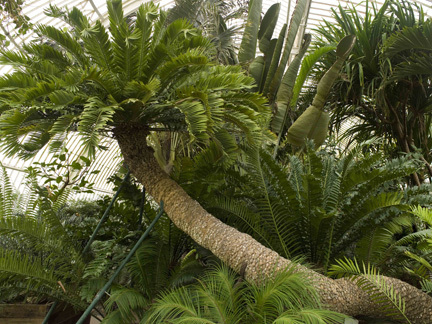 In the Palm House, a timeline reminds us that Kew’s oldest pot plant, a Cycad, which arrived there in 1775, following a long sea voyage from the Eastern Cape of South Africa has lived through the start of The French Revolution, circa 1789, The Great Exhibition of 1851, and, the discovery of water on Mars by Rover in 2004, to name a few shorter lived occurances. All Cycads, some known to live 2,500 years are protected by law. The Palm House, divided into sections according to its’ inhabitants continents, was opened in 1848 and restored in 1957, and the building and opening of the Temperate House at Kew were inspired by the instigation of the railway nearby in 1841. On the opposite side of the lake, People and Plants conveys, through its’ displays, the myriad of helpful ways in which plants improve and impact on human life, i.e., via grains, herbs, and sugar to sweeten the 180 million cups of tea said to be drunk in Britain each day. Princess of Wales Conservatory, where Kew’s fabulous orchids bloom profusely each February, houses cactuses and succulents in one section, and over-sized versions of nearly every house plant I’ve ever known in its’ Tropical Rain Forest area. For many, a definitive highlight of any visit to Kew Gardens is a stop at the pond where stunningly beautiful Lotuses bloom. On this occasion, we were humbled by the sight of a shyly opening, ‘Kerr’s Stowaway Blues’ - perfection realised. The Temperate Zone in this house is home to those ever pesky, but nonetheless lovely, ferns. A huge slice of Eucalyptus wood, like an over sized flower titled ‘Oculus Slab’ by resident artist, David Nash, whose sculptures are on show in the Gardens until Sunday, April 14th, draws photographers near the exit. Nash is mindful to use only dead or discarded wood for such works. Known for its delectable pine nuts as well as its’ beauty, a staggeringly huge Stone Pine tree planted in 1846 on the grounds nearby, has developed uncustomary multi-branched ways necessitating a metal prop to hold it up, as it sat for too long in a pot in a nursery in its’ youth. 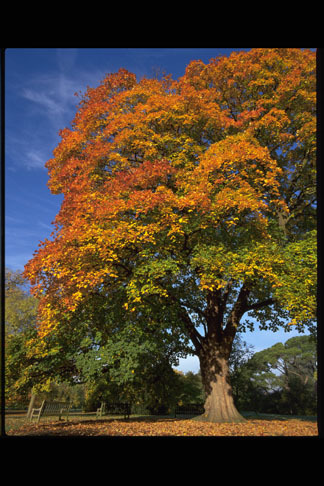 It is one of Kew’s most photographed, iconic images. Slowly winding our way towards Kew Palace, intent on arriving for its’ 11am opening, we enjoy sublime autumn tinged vistas in all directions; reds, burnt oranges and soft yellows not yet predominating, are openly and increasingly emerging. 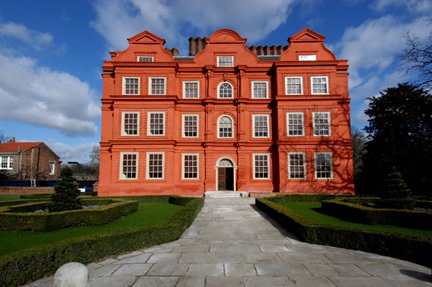 Kew Palace, formerly known as the ‘Dutch House’, originally built in 1631 on the South bank of the Thames at Kew as a Jacobean mansion for City of London, Dutch merchant, Samuel Fortrey, is itself a glorious sight to behold, with its stately red brick façade, rows of tall chimneys, flower dotted, topiary trimmed surrounds and 18th Century costumed guides, ready to answer any and all questions on the former royal home’s history. Glimpses of smaller gardens in back of, and to one side of the Palace, peep thorough its’ gates, inviting further investigation later. Meanwhile, in the Ante Room of the Palace, we are somewhat astounded to come face to face with a realistically rendered, bewigged wax likeness of King George III himself, modeled from life by Parisian artist (arrived in London 1802), Madame Tussand in 1809, accompanied by a recording of an appropriately accented actor speaking as the king in his own words. ‘What, what?’ stands out, just as it did in the film of Alan Bennett’s play, The Madness of King George, a challenging role, vigorously brought to life by and thus, forever linked with late, great actor, Nigel Hawthorn. To our delight, 18th Century caricatures, many by Lord Baker of Dorking, aka Richard Newton, featuring King George III and his family abound in what was once, the King’s Breakfast Room. Elsewhere, it is reported that a lovely painting of young Queen Charlotte, when she was an unmarried Princess in 1761 was sent, in miniature to the similarly youthful King for his approval. 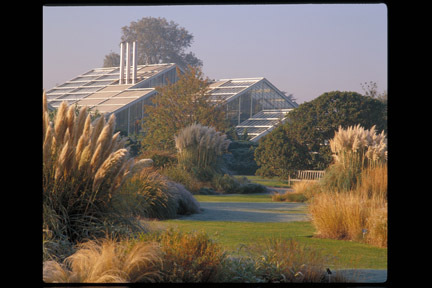 Kew, as a place of ‘summer joys’ in a room showing likenesses of the fifteen Royal children, thirteen of whom lived to adulthood, with audio readings of Charlotte’s fond recollections of those days, gives a sense of family activities in the house, prior to later sorrows, which most likely, made such fond memories all the more precious to those who’d lived them. 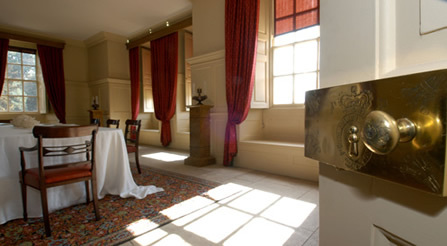 The King’s Dining Room, with its pipe organ and summer fruit laden table furthers this notion. An embroidered self-portrait of Mary Knowles, 1779, is a talking point for Queen Charlotte’s appreciation of that art, and Mary’s friendship with her, during which time she would have spoken to the Queen of her interests in Garden Design, Science and the Abolition of Slavery. The painting The Music Party, by Philip Mercier (1733), of Charlotte and George’s second son, Frederick, Prince of Wales with his three eldest sisters, engaging in, what I’m told was, fictitious harmony, musical or otherwise, lays the groundwork not only for future Princes of Wales’ long patronage of the Arts, but in the case of Prince Frederick, groundwork for later, publicly accessible, Kew Gardens. In Queen Charlotte’s Drawing Room upstairs, we hear of a double Royal wedding, between two middle-aged princes and their perspective brides, as Charlotte, who died two months later, was then too unwell to be moved. This bid for an heir worked beyond hope, as Victoria, Britain’s longest reigning monarch, was born as a result of the union of Prince Edward, George III and Charlotte’s fourth son. Unusual for their time and stations, King George III and Queen Charlotte did not force their children into marriage. 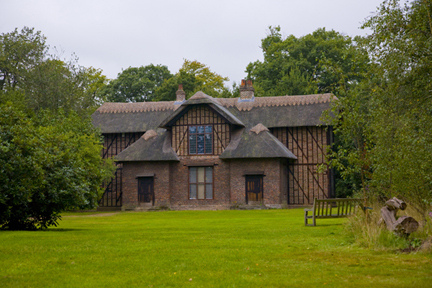 Princess Elizabeth, one of their daughters, a professional artist, was well known for her illustrations of the day, as well as her floral decorating of her mother, Queen Charlotte’s Cottage at Kew. 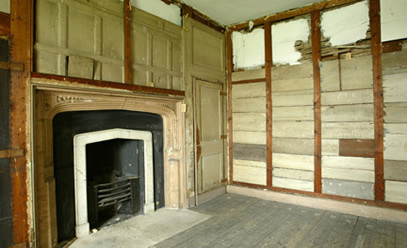 One room in the Palace displaying layers of exposed wall shows bits dating back to 1631, including part of a jib or hidden door allowing servants to enter rooms without using the main corridor, covered over in 1804. King George’s illness divided his physicians, and given the atrocious treatments of the day, i.e. bleeding, leeches, etc. his survival into old age was likely, due more to his strong constitution than ‘medicine.’ When Queen Charlotte died in her chair (on show here) on Nov. 17, 1818, her aged husband was unaware of her passing, as he was then, indisposed at Windsor Castle, blind and sadly, quite mad. A commemorative tablet was placed on the wall of the late Queen’s Boudoir years later by her grand-daughter, Queen Victoria. A 17th Century style garden was also planted behind the Palace in Charlotte’s memory in 1969. 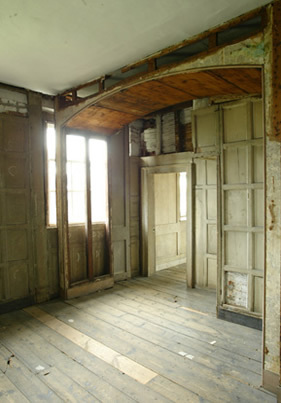 Smaller rooms at the top of the Palace, closed in 1818 following the death of Queen Charlotte, were once home to her two unmarried daughters, Princesses Amelia and Augusta. Though empty now, they offer further insight into their lives and times, via well placed projections, and texted snippets of information. Closed since, the rooms were finally opened to the public in 2006. Inseparable from their former occupants, they seemingly, reek of lingering 18th Century atmosphere. Closeted, early, flushing commodes, invented by Joseph Bramah which needed emptying by servants, remind us that the Palace and its’ trappings were ‘state of the art’ in their day. 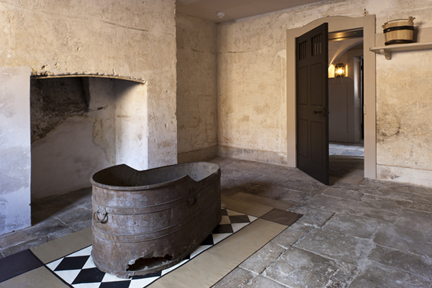 Further indications are in evidence in the Royal Kitchens as we learn that the King preferred to bathe in the small Silver Scullery, amid the china, then make his servants carry hot water into the Palace. 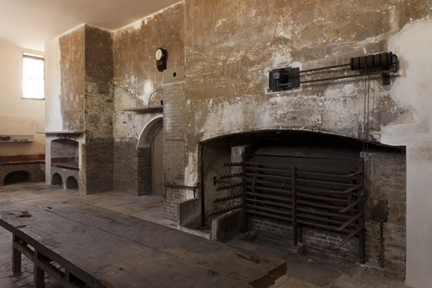 In the Grand Kitchen, with its’ large projected cupboard of copper pots and pans of every size, we are told that the servants of that house ate the same food as their masters, another unusual facet of these royals. The long tattered table from that time is still here, now with projections of the meal prepared for the Royal family on February 6, 1789 being played out on its surface, via projectors above. By the time we’ve reached the Dry Larder upstairs and its’ adjoining Clerk of Kitchen’s Office, with its photocopied receipts for foodstuffs of the time and have appraised leaflets in a room across the hall, one entitled, ‘The Art of Presentation,’ our heads are submerged in Georgian facts, all of them, fascinating. Do go and entertain your imagination! Blessed with sun, we proceed on to the Nash Conservatory, and stand before David Nash’s Cork Spire, an impressive forest like grouping of bark from Portuguese Cork trees. ‘We are in and of the environment,’ the artist is quoted as saying, ‘we are not apart from it or its master – and everything we do impacts upon it, for better or for worse.’ As if in keeping with that, we pass Kew, and the country’s oldest, seemingly, also, tallest, Corsican Pine shortly after, planted in 1814, as a six inch seedling, near the site of the original botanical Gardens. Its details reveal that it has endured, through three lightening strikes and, amazingly, being hit by a light aircraft in the early 1900s. 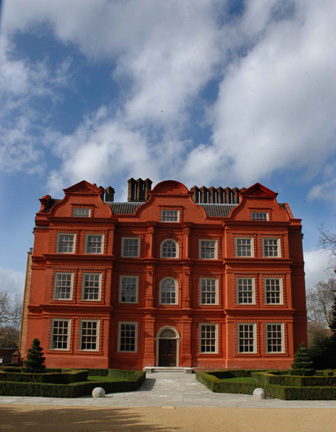 Do yourself and our earth, immediate and wider, a favour and visit Kew Gardens and Kew Palace ASAP. It’s a pleasurable, informative and environmentally friendly way to help keep these lovely gardens and their history going. Copyright (c) all rights reserved EXTRA! EXTRA!